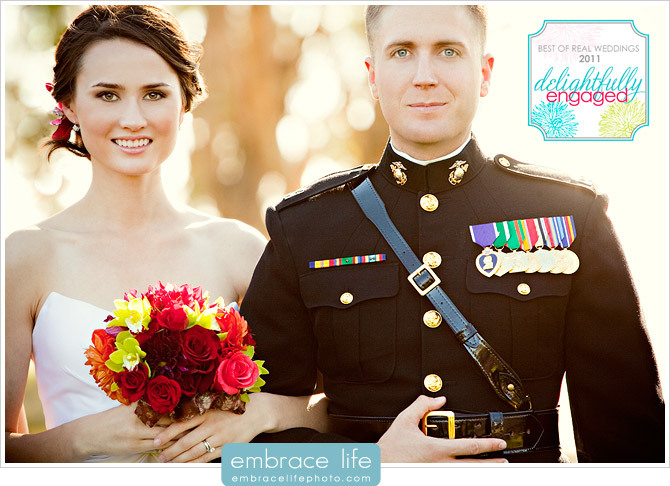 We are incredibly honored to announce that the wedding blog Delightfully Engaged has chosen Deborah and Jeff’s San Diego wedding as one of their Top 5 Real Weddings of 2011. Our amazing associate photographer, David, shot Deborah and Jeff’s military/fusion wedding at The Ranch House at Camp Pendleton. We are very lucky to have David on our Embrace Life team. You can read more about the Top 5 Real Weddings on Delightfully Engaged’s website, here, and this wedding on our blog, here. Thanks to Delightfully Engaged for the great feature!